From the inception of the Buckhead Community Improvement District (CID) in 1999 through 2011, we have spent or obligated $36 million in taxes paid by the commercial property owners within the district. During the same period, we have attracted an additional $90 million in cash or right-of-way donations from other sources ($2.50 for every $1.00 spent). Our job is to optimize how those dollars are spent to make certain improvements within the district. For almost everything we do, we are reacting to conditions, problems or events as we develop solutions, projects and programs. We are pleased with what we have done so far. But it would be far better if we could anticipate the future and plan to get ahead of what will likely occur through development. Being able to test “what if?” scenarios involving real estate development and infrastructure improvement would give us the best chance of maximizing the return on our investment. The Buckhead CID recently selected Parsons Brinckerhoff to develop a transportation and land use model of the entire CID area. Initially, the model will be used to evaluate a “complete streets” project on Peachtree Road, a major arterial serving the CID and Atlanta’s north side, between Maple Drive and Pharr Road. The model will allow BCID to test numerous hypothetical transportation and land use scenarios, such as the impact of adding a new roadway link, evaluating new development impacts, exploring signal timing optimization or transit route operations. North of this location, from Maple Drive to Peachtree-Dunwoody Road, Peachtree Road is already undergoing a “complete streets” transformation with the current construction scheduled to be completed in the summer of 2012. Parsons Brinckerhoff will develop a working, state-of-the-art transportation model within four months that will contain all CID land use and traffic data. The model will allow us to evaluate both the area-wide (mesoscopic) and detailed (microscopic) impacts any future land use and roadway or transit improvements may have on the entire network. Simulations will be used to help identify traffic growth and changing land use impacts and make it easier for stakeholders to decide how to best allocate and prioritize transportation and other investments. We could use a fortune teller, complete with crystal ball and Tarot cards, to give us some level of comfort regarding the millions of dollars we will be spending in the years ahead. I think this is a better choice. Do We Really Need More Transportation Investment? Absolutely. Over the past few weeks, three publications that have crossed my desk provide some interesting information to ponder regarding our transportation future. The first is a report from the American Automobile Association (AAA) titled “Crashes vs. Congestion: What’s the Cost to Society?” For this report, Cambridge Systematics did a statistical analysis of data collected by the Federal Highway Administration and by the Texas Transportation Institute to determine and compare costs of automobile accidents and costs of congestion for urban areas in the United States. The second is an article in the Nov. 8, 2011, Wall Street Journal, called The Hidden Toll of Traffic Jams. In this article, the reporter examines the link between traffic fumes and health, particularly brain health. The third is an Atlanta Regional Commission publication, the “November/December 2011 Regional Snapshot,” which takes a look at the Atlanta region through the eyes of the 2010 Census. In 2009, the total costs of crashes in the Atlanta-Sandy Springs-Marietta metropolitan area were estimated to be $10.8 billion. This is the fifth highest cost among all metropolitan areas in the U.S. The elements that were considered in deriving the total cost included property damage, lost earnings, lost household production (non-market activities occurring in the home), medical costs, emergency services, travel delay, vocational rehabilitation, workplace costs, administrative costs, legal costs and pain and lost quality of life. The cost of congestion for our region was estimated to be just over $2.7 billion for the same one-year period. This is the tenth highest among all metropolitan areas. This cost was based on delay estimates combined with value of time and fuel costs. Now consider what is coming out of the tailpipes of our automobiles as they sit in congestion caused by bottlenecks and accidents. Scientists are becoming increasingly concerned about apparent linkages between tailpipe emissions and public health – specifically decreased mental capacity, intelligence and emotional stability, all from brain-cell damage caused by exposure to vehicle emissions. Many recent studies from around the world are providing evidence of this direct linkage. Finally, the Atlanta region’s population continues to experience dramatic change. And the demographic trends we are experiencing today should continue for the next quarter century. The region is one of the fastest growing in the country, and we are getting older and more diverse. The needs and wants of our changing population will be different than they have been up to now, and we must be prepared to respond to that demand. First, in order to address the concerns above, we absolutely must increase our investment in transportation infrastructure in the Atlanta region (click here to visit Transform Metro Atlanta’s website to learn more). The transportation referendum we will vote on next July 31, 2012, will give us the chance to pump approximately $8 billion over a 10-year period into the region’s transportation portfolio. Consider that this is approximately what the state will collect in motor fuel taxes state-wide. Now subtract 30 percent to cover current debt service, and more dollars to cover the costs of the state Department of Transportation. What is left over must be balanced across Georgia’s 13 Congressional Districts. A relatively small fraction is, therefore, spent in the Atlanta region, almost all of which must be spent on roads and bridges. The July transportation referendum would dwarf what we get from the state and federal governments. Consider the top 10 public transportation regions in the country: New York, Boston, Chicago, Washington, D.C., Atlanta, Los Angeles, Philadelphia, Baltimore, Seattle and San Francisco. These regions account for about a quarter of the nation’s population and a third of our economic output, and they are projected to grow 26 percent in the next 30 years. Public transportation is a vital part of these regional economies, yet a huge backlog exists in investment required to bring the systems in our top regions up to a state of good repair. 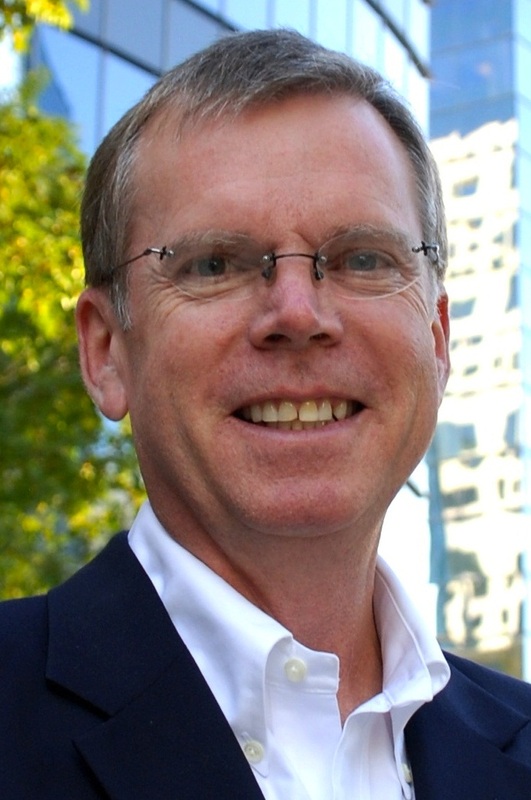 My friend, Neal Peirce, recently wrote an excellent essay on this subject, which referenced MARTA and our region’s transportation investment referendum to be held next July. I recommend it to you. Will We Make an Investment in Our Future Prosperity? Much has been written and reported recently about the transportation project list being developed right now by the Atlanta Regional Roundtable. Allow me to summarize how we got to where we are today, what is immediately ahead of us and what this opportunity means – I will try to be brief. This is a very important opportunity to understand, so please read this post and then pass it on. Metropolitan Atlanta has a problem with transportation. Georgia spends less money per capita on transportation than all but one other state. We have underinvested in our infrastructure, and we now have traffic congestion that is adversely impacting our economy and quality of life. After four years of repeated attempts to get a bill passed in the Georgia General Assembly allowing the citizens of metro Atlanta to tax themselves to fund transportation improvements, we finally had a bill pass in the 2010 legislative session, which the Governor signed, creating the Transportation Investment Act of 2010. This gives the 10-county metro Atlanta region, as well as the 11 other regions that make up Georgia, the opportunity to add an additional penny sales tax for 10 years to fund specific transportation projects and programs within each region. Roundtables have met in each region of the state, consisting of county commission chairs and mayors. These groups of locally-elected officials have held public meetings to decide how the expected tax receipts over the 10-year period should be invested. They have been told how much money should be collected, and they have been given a list of eligible projects and programs which could be funded with the tax. The public has had opportunities to voice their opinions about various projects. In the Atlanta region, a series of public meetings is being held this month to explain what has been done to date and what is ahead. Please attend a meeting. This is the first time in Georgia that regions will come together to take regional votes to solve regional problems. Also for the first time, we will have an opportunity to create a pool of funds that can support not only roads and bridges, to which our gasoline tax is limited, but all modes of transportation, including transit, pedestrian and bike facilities. This effort is about jobs and quality of life for our families, our region and our future. It is about job creation and keeping jobs in the region. It is about relieving traffic congestion so that we can spend more time with our families and at work and less time in traffic. It is about creating more options for getting where we need to go. This effort is also about creating very clear expectations regarding where the funds will be spent, what projects will be built, how much they will cost and when they will be delivered. The project list for each region will be set by October 15. You will have an opportunity to vote next July to create this 10-year tax to fund the October 15 project list. This is big. This is important. Be informed. 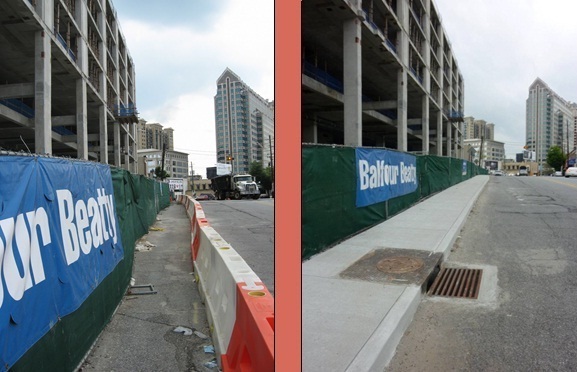 Before and after images of the Streets of Buckhead temporary sidewalks. The AJC and Atlanta Track Club’s Fourth of July tradition takes runners through the heart of Buckhead. This year, runners will have a safer route along Buckhead Atlanta (formerly the Streets of Buckhead) on Peachtree Road. Construction previously blocked the existing sidewalks, making it unsafe for pedestrians, but recently, the BCID had the construction barriers moved back and replaced with temporary sidewalks – just in time for Peachtree Road Race participants! 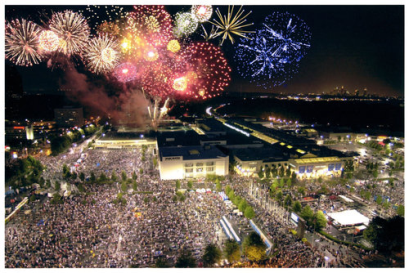 Lenox Mall has always produced spectacular fireworks displays after the sun sets on the Fourth of July, but this year they are adding a new, delicious event – Taste of the Fourth. For a $10 admissions ticket (which benefits the Atlanta Mission), you can sample food from local restaurants and reserve a spot to view one of the largest fireworks displays in the Southeast. Walking and driving to Lenox Mall is getting a whole lot easier, thanks to BCID’s Peachtree Boulevard Transformation. We are currently installing 11,500 linear feet of new 11-foot wide sidewalks, complete with new oak shade trees, 188 new pedestrian and street lights, modern benches. In addition to the streetscape, we are a constructing new planted median with dedicated left turn lanes, new bike lanes and crosswalks to help you get to future fireworks shows safely! Last month, the Buckhead Community Improvement District made several exciting announcements at our annual reception, including our partnership with the PATH Foundation, City of Atlanta, Buckhead Coalition, Livable Buckhead and the Buckhead Business Association to create a trail along Ga. 400. This greenspace will begin near Loridans Drive and end in Midtown, providing a pedestrian route through the heart of Buckhead and beautifying our community. The PATH Foundation has divided the trail into five segments, and the BCID and City of Atlanta have each donated $200,000 to complete the first two segments. We expect additional funding from the Buckhead Coalition and even more funding from an unlikely set of gigantic, colorful statues. One of the many statues available for sponsorship, with proceeds going to the proposed Ga. 400 trail. That’s right – statues. The Buckhead Business Association has large statues of Bucks available for local businesses to purchase. The plain statues will be transformed into works of art by Atlanta artists and placed around our community, much like Chicago’s famous cows. Proceeds from the “Bucks on the Street” program will go directly to our community, benefiting the proposed trail. BCID’s involvement with the creation of this greenspace is another way we are making Buckhead a more livable community. To learn more about our pedestrian initiatives, click here. 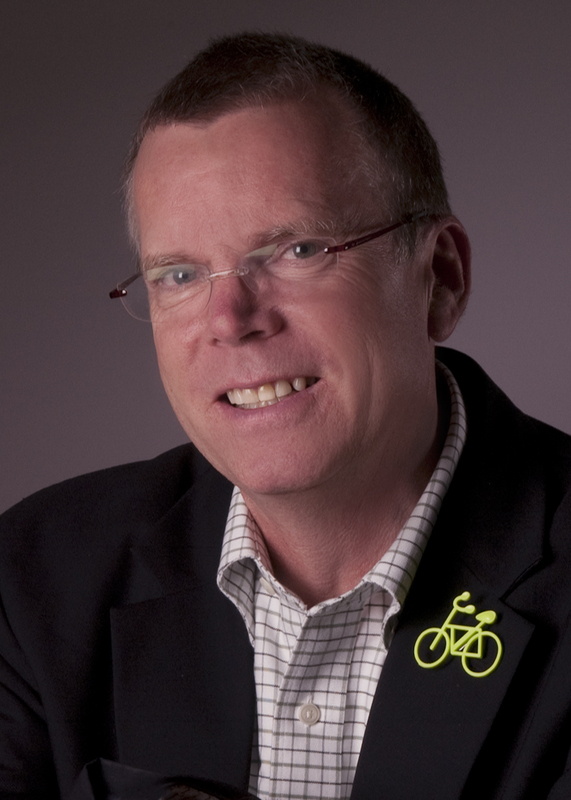 Highways, railroads, light rail, buses and bicycle lanes – while you might not take advantage of each of these modes of transportation, our city needs a robust infrastructure, and I’ll tell you why in my guest column for the SaportaReport. Atlanta was built around transportation, and transportation investments are integral to Atlanta’s successful future. Click here to read the column and learn why I recommend a balanced approach to transportation.